I knew it. I just knew it. I felt her heartless tone in my bones. In 1973, my wife and I decided we must meet with my parents and explain why I was hospitalized. I wanted so badly to lie and say I had my appendix removed, and keep my mental illness to myself. But no, I had to seek my parents’ love and support for this scary illness. I didn’t even understand the doctor when he explained bipolar disorder. My parents always glossed over any negatives in their life by not talking about them or sweeping them under the rug. But, the thought didn’t enter my mind as I prepared to share my news with them. 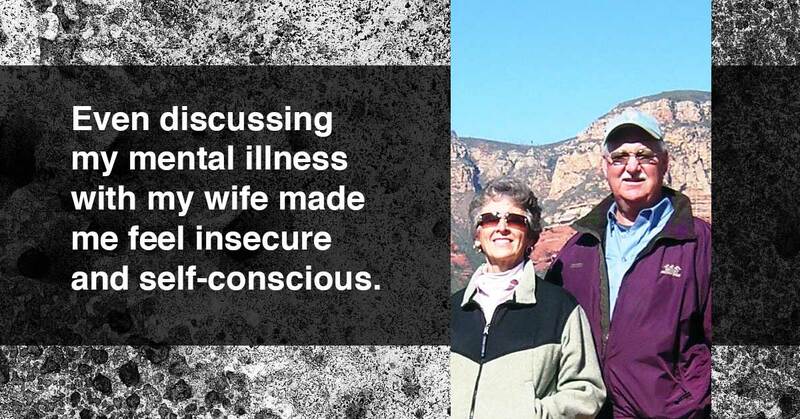 Even discussing my mental illness with my wife made me feel insecure and self-conscious. My high hopes for my parents understanding and support were dashed by my mother’s words. This is it? A cold shoulder? No sympathy or concern? I felt so betrayed and angry that I left my love for them at their doorstep, retaining only the required respect for them as my parents. They never spoke of my mental illness again, and from that day on they hid behind my mother’s words, as if that part of me didn’t exist. Every morning since my diagnosis, I’ve been afraid of what unacceptable behavior or action of mine lay ahead of me. Lithium, the medication my doctor prescribed, was supposed to stabilize my moods, but I still experienced deep depression. These issues made me apprehensive about my job, managing a department of fifteen people. 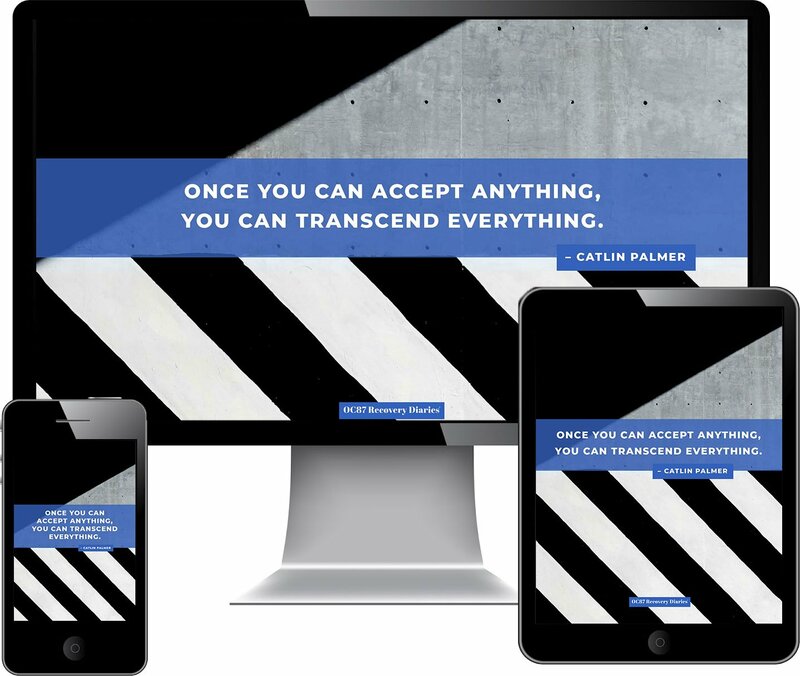 We provided product training material for 500 construction equipment dealers in the U.S. and Canada, making this broad personal exposure unnerving. 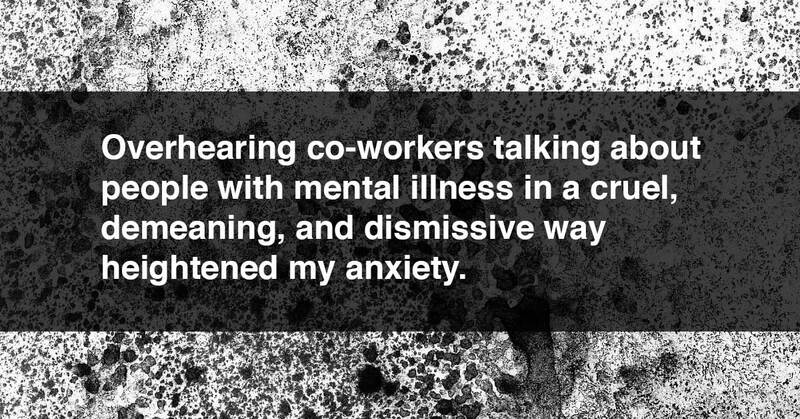 Overhearing co-workers talking about people with mental illness in a cruel, demeaning, and dismissive way heightened my anxiety. Their attitudes increased my fear of discovery, which caused me to withdraw into myself even more. Wanting no one to talk about me that way I vowed to protect my job, home and family. 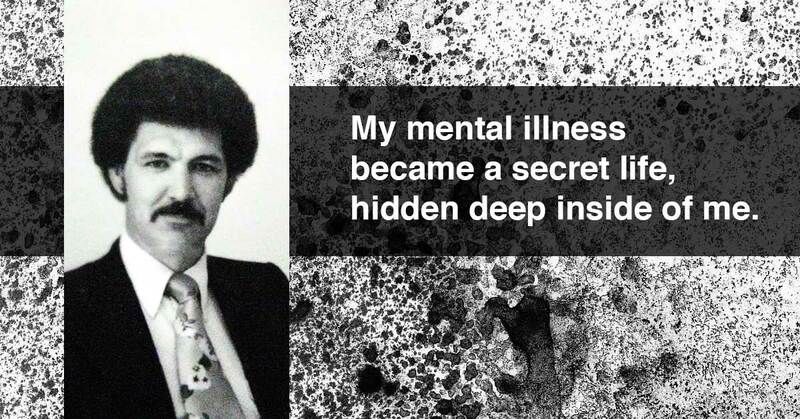 My illness became a secret life, hidden deep inside of me. Depression and despair took over, leading to thoughts of suicide. Emotionally cornered and seeing no way out, suicide was a convenient solution. Many nights at 3 a.m. I’d sit staring out the window, watching the snowflakes fall around the porch light, thinking about how I could end my bipolar life. If I committed suicide, I wouldn’t have to deal with the pain of my decision, or explain myself to anybody. Suicide would relieve my turmoil, but I was bothered that I’d leave my children with a pain of their own that they didn’t deserve. At these times, severe depression paralyzed and immobilized me so much that thoughts of ending my life lived only in my head as my body was frozen and immobile. I’ve learned that twenty-five to fifty percent of people with bipolar disorder attempt suicide. It was a blessing that I was unable to act out my suicidal thoughts. By 1976, when we left Iowa for Milwaukee, Wisconsin, my veil of secrecy was well-developed and a critical part of my daily existence. Always on edge, I watched from moment to moment for clues from co-workers about the impact of my behavior. To protect my secret I did not want to raise any concerns about my management ability. On one occasion I came as close to being fired as one can get. I started work at a consulting firm as a division manager. On my first day, the president asked me to meet his longtime friend and client for dinner so he could get to know me. I thought this would be cool. Dinner and a few drinks on the house. After dinner, we retired to my hotel for an hours’ worth of conversation. We had a nice evening. Only because the president hadn’t seen this behavior before he hired me, I kept my job. But with the admonition, “If this ever happens again, it will be your last day here.” I call this a “blackout,” but not in the true sense. I had no idea what I said or did to make his friend say those things about me. I was so scared. I had relocated and been on my new job for one day. I wanted to run away and hide. How can I ever trust myself? How will I ever know if this is happening again? Fear took over my life for a long time. Bad judgement is a bipolar symptom, and bad judgement got me fired. In my second year as Assistant Golf Course Superintendent in Arizona, I was asked to participate in a 360-degree performance review of our Superintendent. The mechanic and head irrigator were asked to do the same. All of us knew of our manager’s habit of placing a six-pack of beer between the seats of his truck and drinking all day. They told me they were going to include this information on their reviews, and wanted me to follow along. I had a strong moral conflict working for an alcoholic. So I had no problem following their lead and pointing out in my review that our boss drank alcohol on the job. Three weeks later the Superintendent picked me up in his truck and took me to the clubhouse. I was surprised to find myself in a meeting with the vice-president, and even more surprised to learn that I was being fired. Apparently the irrigator and mechanic did not accuse my boss of drinking on the job, as they said they would, leaving me hanging out to dry. In both cases I accepted the blame without disclosing any part my mental illness may have contributed. I would take ten lashes from a cat-of-nine-tails or walk the pirates’ plank before I’d reveal that my errors in judgement were due to a mental illness. For thirty-five years, my focus was self-centered and introspective regarding my behavior and medication. However, in 2008, a new psychiatrist opened my eyes to environmental factors proven to help manage bipolar illness. He showed me how avoiding blue light enhances sleep management, and how sunshine and exercise positively reduces depression. I knew these environmental changes were working well for me because my friends gave me no feedback indicating I behaved in an erratic, moody or abnormal fashion. The first crack in my veil of secrecy occurred in 2010 when I sat with a friend who was trying to deal with a bipolar woman he was dating. As I listened to his story I struggled with revealing my truth. Feeling his need was as important as my secrecy, I told him about my bipolar illness, and said that I preferred to keep my illness just between us. I shared my experiences and insights. Over time, he recognized the issues we discussed, and chose to end the relationship with her while keeping my secret safe. One summer my wife and I drove to Vail, Colorado with friends, I thought my moods were relatively stable and unnoticeable. But, when I told them I was bipolar, their response was a casual, “Yeah, we’ve noticed.” Shocked that my closely-held secret was apparently so transparent, fear gripped me as I learned how others viewed my behavior without my awareness. Over time, I shared my illness with six of my friends, and they all chose to continue our relationship. My protective veil diminished, reducing my anxiety and lifting a weight off my shoulders. Occasionally, one of these friends would tell me, “You don’t seem to be yourself today,” I’d quickly become aware my mood had changed. What a revelation for me! Finally, a clue about my current behavior I’ve never been aware of before — something I can work with to moderate my behavior. 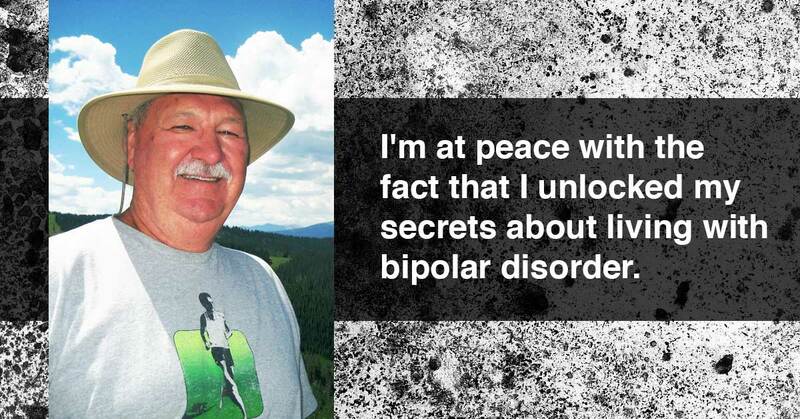 I never would have heard this if I hadn’t been open about being bipolar. In 2011, after retirement, I began writing, and published three fiction novels by 2013. Success with these novels led me to believe I might have the talent to complete a long-term goal of mine. I wanted to share the story about my bipolar life. Knowing that each one of us suffering from bipolar syndrome is as different as snowflakes, I hoped my experiences might be beneficial to some patient or their loved one. My age had something to do with my sense of urgency. 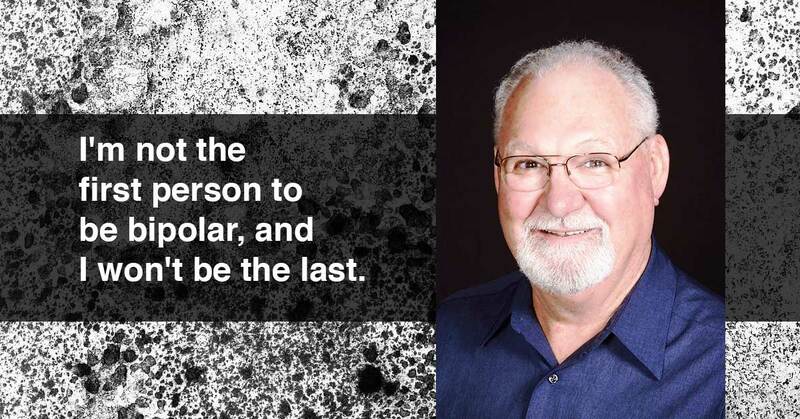 I’m 72 years old and retired, so now my “bipolarness” can’t destroy my employment or future anymore. Also, being in the winter of my life I didn’t want my experiences to be buried with me. Especially the things I’ve learned that help me manage my bipolar type II, illness. All this is easy to say, and hard to do. What I have always held within myself will suddenly be exposed to the world. Symbolically, it would be like walking across the street, knocking on the door and telling the folks who live there that I’m bipolar. It’s been my secret for over forty years, and opening the door for everyone to see is frightening. As I began writing the memoir, I was very uncomfortable. Exposing my personal experiences negatively affected my writing and became a problem. Just how personal should they be? For example, I can’t talk about rage without describing the scene. Then I would be viewed as abusive, in the eyes of social media and the world. Being bipolar doesn’t let me see rage that way. Rage is blind. The rational mind can’t comprehend the fact. Rage does not come from forethought. Rage boils in the belly as I feel verbal abuse and demeaning attacks. Like a pressure-cooker, each incident builds until the hurt and anger is steaming inside. When rage explodes it doesn’t care what the target is. Rage will attack the irritating cause until it is silenced. 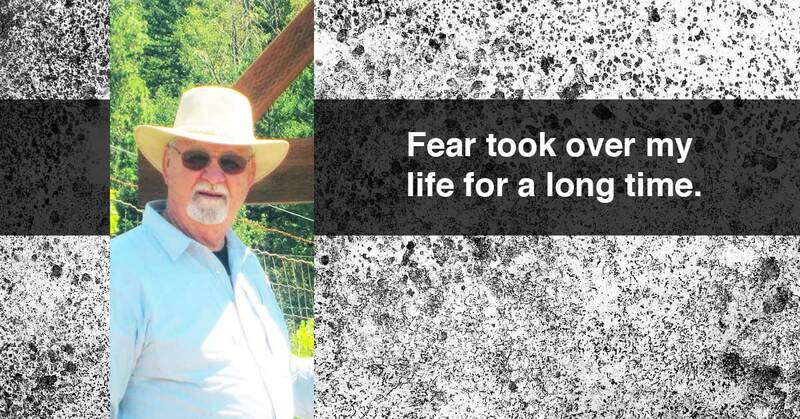 Rage wasn’t the only stumbling block in the writing of my memoir, Fear Is My Co-Pilot. Numerous times I walked away from my writing to contemplate what I was doing. I hoped sharing my bipolar experiences could be helpful, but they are raw and ugly. Why should I dig them up like an archeologist and analyze them? The hurt returned with each experience I revisited. I came to a crossroads. I had to embrace the fact that my memoir would be of no value unless it was truthful. It was either open up, or give up. So I opened up. Once my emotions were under control, I was able to finish. When we released the book, three friends wanted a copy right away. One of them, a woman who works for the United Way Men’s Shelter, bought books for three men at the shelter who are also bipolar. I felt wonderful. This is exactly the reason I wrote the memoir. A week later I participated in the local library’s “Indy Writers” book sale. Although I didn’t sell one copy of my memoir, six people visiting my booth wanted to talk about a friend or loved one who was bipolar. Their emotions ran deep. I was simply amazed how the presence of my memoir opened up these conversations. I’m at peace with the fact that I did the right thing unlocking my secrets and writing my memoir. I’m not the first one to be bipolar, and won’t be the last. Others will write their stories. However, sharing what I’ve learned may open some doors, and encourage others with this illness to begin managing their bipolar illness.